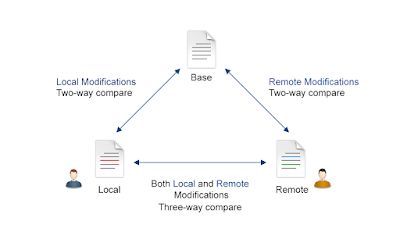 The new XML-aware three-way file comparison feature helps you solve conflicts and merge changes between multiple modifications of the same file. 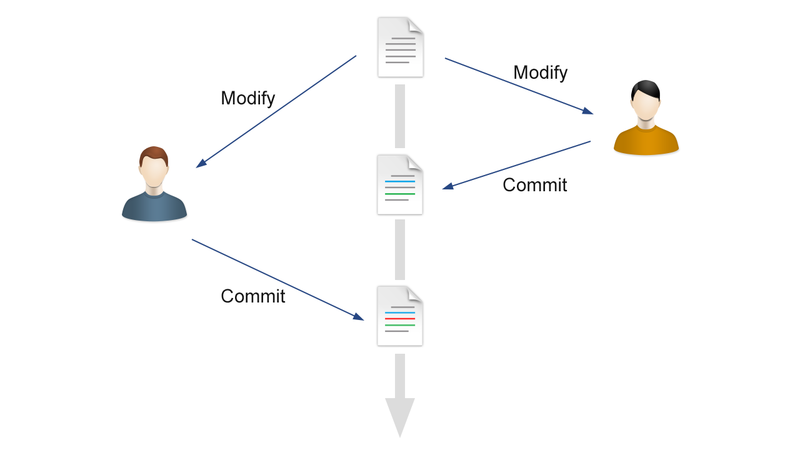 It is especially helpful for teams that have multiple authors working concurrently on the same documents. 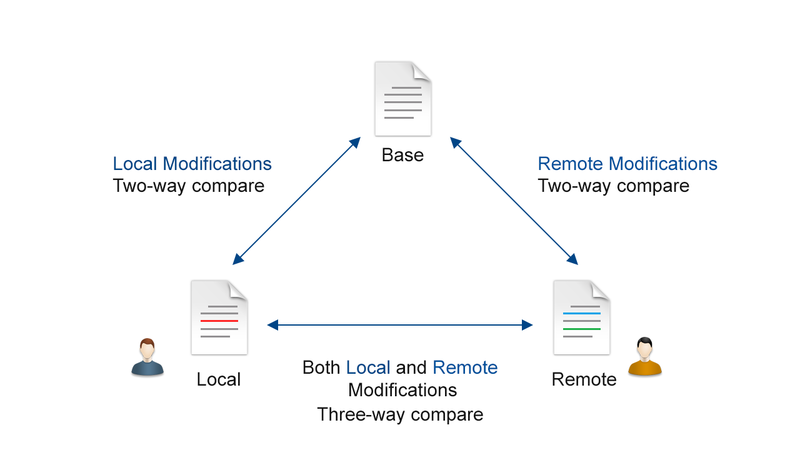 A three-way file comparison feature was added to the file comparison tool to help you solve conflicts and merge changes between multiple modifications. It is especially helpful for teams who have multiple authors editing and committing the same documents. It provides a comparison between a local change, a remote change, and the base (ancestor) revision. You can use Lines, XML Fast, and XML Accurate algorithms for the three-way comparison feature in the file comparison tool and in the Compare view in Syncro SVN Client. Lines - Computes the differences at line level, meaning that it compares the files looking for identical lines of text. XML Fast - Works well on large files or fragments, but it is less precise than XML Accurate. XML Accurate - More precise than XML Fast, at the expense of speed and memory. It compares two XML files or fragments looking for identical XML nodes. The Files Comparison tool can be integrated with file versioning systems in order to visualize changes in a side-by-side manner ans solve conflicts. The File Comparison tool now automatically performs a second level comparison for the Lines, XML Fast, and XML Accurate algorithms. After the first comparison is finished, the second level comparisons are processed on text nodes using a word level comparison, meaning that it looks for identical words. This second level comparison makes it easier to spot precise differences and you can merge or reject the precise modifications. A new option was added on the toolbar of the File Comparison tool and in the Compare view in the Syncro SVN Client. You can enter an XPath 2.0 expression to ignore certain nodes when comparing using the XML Fast or XML Accurate algorithms. 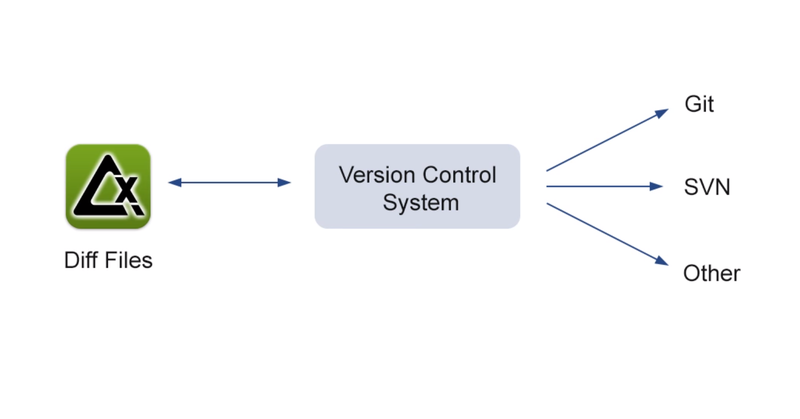 This demonstration will show you how the oXygen three-way comparison feature works and how you can use it with file versioning systems.